Being pregnant is hard, being pregnant with gestational diabetes adds a whole new level of difficulty to your pregnancy. I managed to control my Gestational Diabetes naturally through my diet, but it took a lot of discipline and planning to keep myself on track. Not to say that I was even close to being perfect! Through trial and error, I learned a few things that worked for me and that will helpfully work for you as well. Tracking your food consumption and sugar levels is the key to naturally controlling your gestational diabetes sugar levels. You need to be completely honest with yourself and your doctor. I know it is tempting to leave a few items off or check your sugar levels at 1 1/2 hours instead of 1 hour, but don’t do it. The health of your baby is at stake. I used these forms to track my eating and blood glucose sugar levels. I created them after getting annoyed with the forms the doctors gave me. After 2-3 weeks of food tracking and sugar testing, you should have a fairly good idea of what food works for your body. Use the food list you’ve created to start your gestational diabetes meal plan. Keep in mind that as your pregnancy progresses you may need to adjust your foods periodically. Gestational Diabetes becomes harder to control in late pregnancy. For example, when I first started, I could get away with eating oatmeal. This is the lowest carb oatmeal I found. I added flax seeds, nuts and skipped the fruit and milk. Another option that worked for me was these high protein pancakes. I added eggs and used high protein milk. Unfortunately, by the end of my pregnancy, I had to switch to foods higher in protein like eggs. As I found food that worked, I wrote a list of food that worked well for my body and just rotated them. It got a bit boring occasionally, but it worked. After my pregnancy, I found out that most women with gestational diabetes are successful on a Paleo diet plan. If you are struggling with meal planning you may want to check out the Paleo Diet Meal Plan. I love meal planning services, having grocery lists and food ideas on hand makes cooking at least semi-palatable – I hate cooking! Another option is foods based on the Keto Diet. Most of their foods are based on high fats and proteins with low carb counts. If you are looking for a quick, fun resource for Keto Meal planning check out Keto Meal Planning Made Simple. This meal planning guide links to some of the most awesome recipes. I’m not doing the Keto Diet, but some of the food on the list is amazing. 2. If you are going to try a new food, plan the diet modifications in advance. Once you stabilize your numbers with your food tracking and sugar tracking, you kind of get a feel for food will work for your gestational diabetes diet. Everyone’s body reacts to sugar differently, so what may work for other’s may not work for you. For example, I learned quickly that I couldn’t do pasta. This was devastating for me since I love pasta. What I wasn’t sure about was Thai food – which is my other love. I decided to try it out but was careful about my choices. I chose a high protein meal that had chicken, nuts and tons of veggies in it. I skipped out on most of the rice and asked about sauces that were low in sugar. My meal wasn’t my favorite Green Curry, but it worked. My blood sugar numbers were slightly higher than normal, but during the meal, I drank more water than normal and then went for a walk after eating. If I knew that I was going to be taking a chance with a meal, I always tried to watch my protein/carb ratio, increased my water consumption and planned for light exercise afterward. One way to help your sugar levels with gestational diabetes is to drink lots of water. I found that using veggie infused drinks helped me drink more water. Another trick that worked for me was eating protein bars with before eating anything that was higher in carbs. I personally loved these protein bars. Keep in mind, by the very end of my pregnancy, my numbers were gradually increasing, so I had to stop experimenting for my last 2-3 weeks. My food craving had fortunately decreased by this point, so although it wasn’t easy, I was able to manage it. Watch your sugar numbers carefully and if they start spiking then you’ll need to go back to the basics. 3. Incorporate healthy habits into your daily life. Finding simple ways to exercise during your pregnancy is super important, especially when trying to manage your blood sugar numbers. It is hard to do regular exercising when you feel bloated, are having stomach issues and moving like a beached whale. The trick is to get creative. I did a lot of walking during my pregnancy. I found that a simple 10-minute walk after my meal made a huge impact on how I felt. I’m assuming it helped my numbers, but don’t have any imperial numbers to support my belief. By the end of my pregnancy it was starting to get pretty hot (I live in Phoenix and it was late April), so I had to adjust my exercise. At that point, I would pace in my house while I was on conference calls. I would bounce on my yoga ball to keep my body moving. When sitting I would stretch my calves and rotate my shoulders and back. I kept bands like these at my desk and used them frequently. I tried going up and down my stairs but quickly decided that wasn’t a smart idea. It is all really small things, but small little movements add up and they keep your blood flowing and your body active. Again, I’m not sure how much of an impact they had on my sugar numbers, but they helped me feel better on a physical level. One of my favorite activities was Yoga. I highly recommend yoga when pregnant. It is a great way to keep flexibility without stressing out your body. You need a really good support group when you have gestational diabetes. It is really hard to control your eating when pregnant and when you add the food restrictions for diabetes it can be a recipe for disaster. Sometimes you just need to vent. Or at least I know I did – hopefully I’m not alone in this one. If your family and regular friends don’t get it and often they won’t, reach out to people who have had the same condition. I joined a couple of gestational diabetes support groups on Facebook that really helped me when I felt alone and misunderstood. One word of caution, do your own research. There are people in those groups who shouldn’t be giving advice. If something sounds off, talk to your doctor. Don’t just assume that because you found it on the internet it is correct. Which bring up another point. I’m a researcher and love the internet. There is so much useful information readily available to everyone. There is also a whole bunch of fake, incorrect and potentially dangerous information available. • If something sounds off, it probably is. • Make sure and double check anything that seems out of the norm. • Get your information from credible sites. • Just because you like something you hear doesn’t mean it is accurate. Just be careful about the information you choose to listen too. I read some crazy stuff that quite frankly sounded dangerous and stupid. When in doubt always check with your doctor. I work for a group of doctors, so I know that not all doctors are perfect. So, I give this same word of warning on the other end. Research your doctor. In the gestational diabetes support groups, I heard some really crazy stuff that doctors did as well. Overall just remember that there is a reason that doctors have a ton of schooling and continuing medical education requirements. They aren’t perfect, but they do have access to information that isn’t available online for everyone. It sounds so simple, but it takes a lot of work and dedication. Always test your blood as directed by the doctor, eat throughout the day and decrease your carb consumption to match your protein intake. Exercise, drink plenty of water and avoid sugary beverages. Obviously, it is a bit more complicated than that, but if you stick to these basic and listen to the advice of your doctor and dietician you will hopefully have positive outcomes. If something feels wrong, contact your doctor immediately. 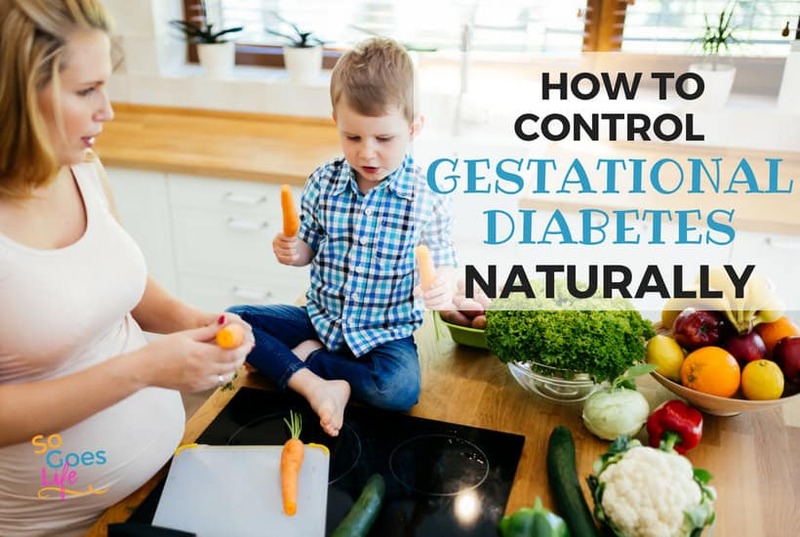 Although gestational diabetes isn’t typically a life-threatening condition, it can be a serious condition and you don’t want to take chances with your health or the health of your baby. You are the number one source of knowledge on your body. Trust yourself enough to know when something is wrong. Pay attention to how you feel and don’t be afraid to ask questions and push for answers. I know it sounds odd, but gestational diabetes ended up being a blessing in disguise for me. I really thought I was healthy prior to my pregnancy, but quickly realized that I wasn’t getting enough protein in my diet. I’ve reshaped my current diet as a result of the knowledge I gained during my pregnancy. Although learning how to control sugar levels naturally during pregnancy is difficult, gestational diabetes is something that most women can control through diet and exercise. Just remember that your gestational diabetes will be hard to control in late pregnancy, so do your best to develop good habits early. 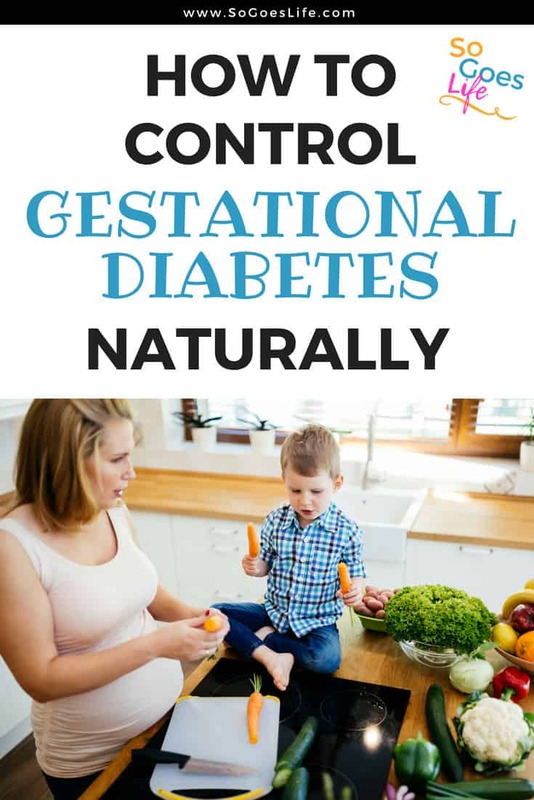 You can treat gestational diabetes during pregnancy naturally. However, don’t feel bad if you need to take medicine. Gestational Diabetes has a mind of its own and even perfect eaters end up having to take medicine. Don’t fall into the guilt trap if your body doesn’t want to behave. PS. I know it is a hassle, but I really do recommend taking the time to track all of your food and sugar levels. Once I committed myself to complete honesty on my forms and really started tracking everything I was amazed at how much easier it was to eat correctly and keep my sugar levels in check. I sell the Gestational Diabetes Blood Sugar Tracker forms on Etsy for $3.00, but if you are tight financially, drop me an email and I’ll send you one for free.